I’ve known Lynette Chiang for years. She had a great job, Product Evangelist for Bike Friday and travels all over on her pink Bike Friday. At one point I had the joy of her attendance as a Candidate at a 2010 LCI Seminar (see www.bikeleague.org) in Albuquerque NM in which I was assisting Craig Degenhardt. Lynette is a writer, film maker http://trafficconebag.com and great friend…at least I think so. But one of the best things she has done is design the “Traffic Cone Bag.” I carry a laptop or iPad almost all the time and the TCB is pretty nearly perfect. With the black side turned out I can just slide the iPad or laptop inside or there is a pocket on the outside that snaps and can hold the iPad. The iPad slides easily inside or in the side snap pocket. 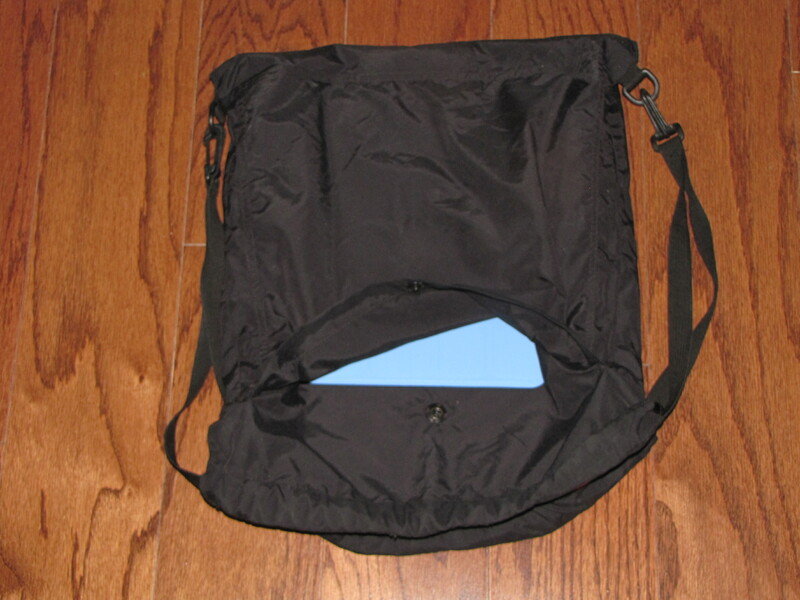 It doesn’t look like a bag I would be carrying a laptop or iPad in. iPad in the new case slipped into the outside snap pocket. When the orange side is out the pocket is inside and hidden. Simple idea, great execution. After traveling around places that don’t have a lot of what we take for granted every day she felt a need to have a simple bag that could be used to carry stuff and provide visibility on the road and be suave enough to carry into the nicest places. Voila! In the interest of full disclosure, Lynette sold me my original bag without the current improvements but she has offered to send me one with the reflective stripe and the new TCB snap. The bags come in two sizes and they are not cheap but the are well made and mine shows no sign of wear after almost daily use since 2010. I’ve got lots of bags, most of them messenger bags that go over one shoulder. 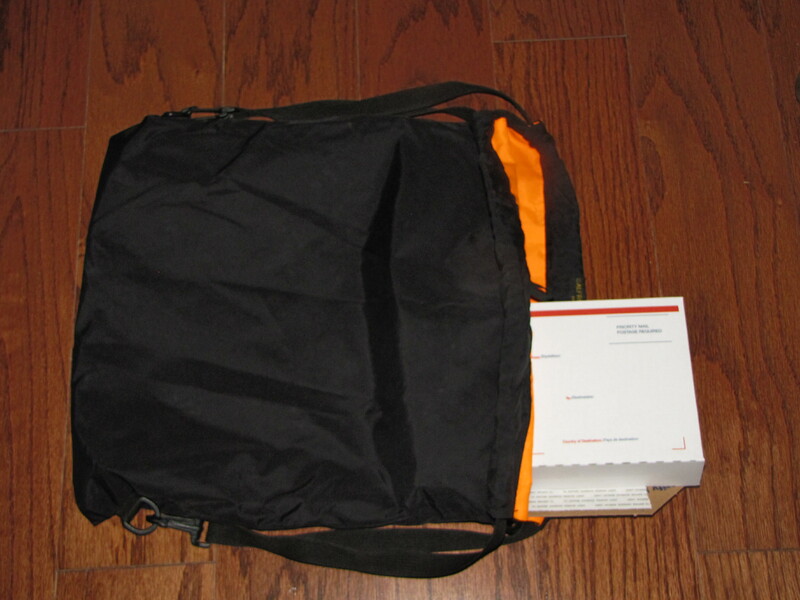 The traffic cone bag is the right bag to go to the post office when I need to take a few shirts to mail to customers. I use the small fixed rate box to send out T-Shirts and as you can see at least four of them would fit easily into the large TCB. 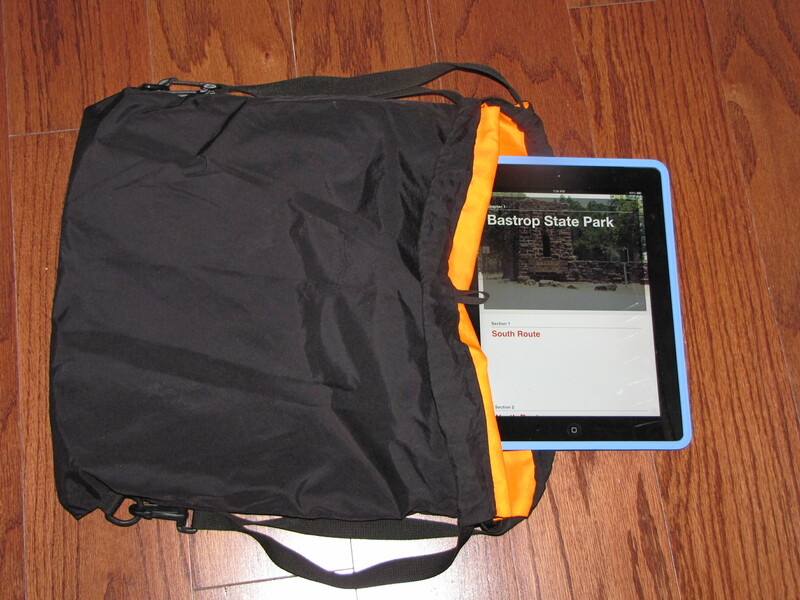 The orange side has two pockets that can hold a big water bottle and the little loop is great to hang reflective tabs or a light for night riding. I like it. On of the additions I have made is to put a small carabiner between the straps in front to hold them close together. 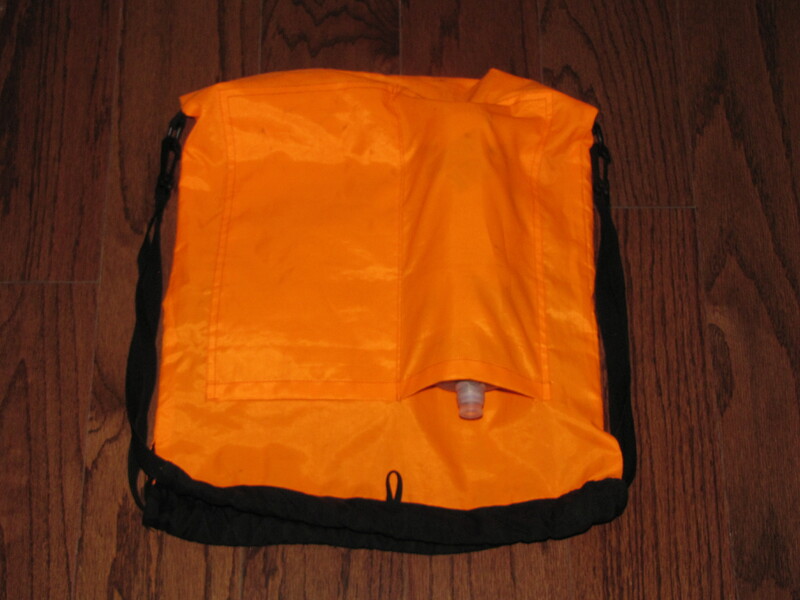 Two pockets on the orange side hold a water bottle and the loop is good for lights or reflective tags. Lynette also put up a little fun film that she did in Albuquerque about me and my iBag or man bag. Long history in the bicycle safety world. League Cycling Instructor and expert witness in human behavior in traffic. This entry was posted in Education, Equipment and tagged bicycle, Equipment, Visibility. Bookmark the permalink. I like. May have to get a couple of these. Diverging Diamonds are a cyclist’s worst enemy.